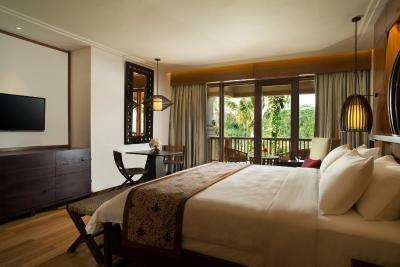 Lock in a great price for Padma Resort Ubud – rated 9.4 by recent guests! The room is clean , big and have modern design. The landscaping of outside is very beautiful. All of staff very kindly and friendly. Everything! Best resort in Bali, we will be back. This should be a 7 stars resort! Amazing and I can’t put in words how much we enjoyed our stay. They even had a menu for pillows ! I mean my god they are amazing and the staff is soooo friendly. I wanted to cry when it’s was time to leave. 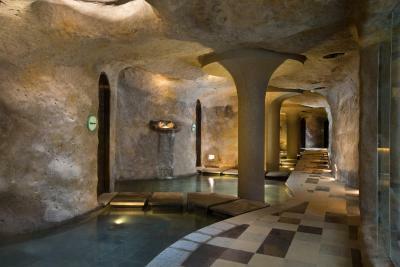 The spa is just magical (it’s one of the best resorts I have ever been and I’m really picky and very hard to please) I couldn’t find one negative thing in this place ! I don't even know where to start..the property is a dream! The location in the middle of the jungle is just amazing, the staff is just wonderful and extremely welcoming. Big thank you to the F&B Manager, Deasy and chef, Solo for taking care of us so well and making our wishes possible in any way. The landscaping is just breathtaking, We were pleasantly surprised that all all activities (such as mountain biking, yoga etc) are included as well as complimentary afternoon tea. The pool was huge and great, perfect temperature and just relaxing. They also have free shuttle bringing you to Ubud (40min). The room and bathroom were spacious and pleasant. It's not just a resort, it is an Experience!! Must have experience. Great views. Cleanliness. Rooms. Staff. Overall ambience. The rooms were extra large.. Bathroom awesome.. Pool magnificent.. Staff very kind..
Everything was really good! The hospitality, very welcoming workers, the chef was really nice to guide us and offered us complimentary dishes! The manager of the hotel was really nice! Our room had a great view to the forest! We enjoyed the trekking to the river and the forest. Bicycle tour to the village was really nice. The hotel design is super! Very clean and neat. Buffet dinners were really really good. The pool and the view were amazing! The spa was super! We wished we can stay longer. We would definatley come back again! Our stay was amazing, delicious food, spectacular pool and great spa facilities. Highly recommended. Padma Resort Ubud This rating is a reflection of how the property compares to the industry standard when it comes to price, facilities and services available. It's based on a self-evaluation by the property. Use this rating to help choose your stay! 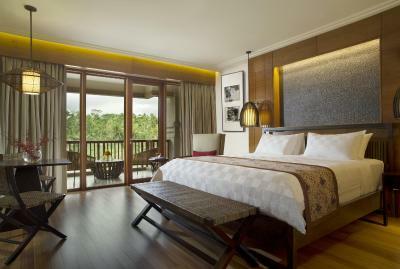 Located in Payangan just 8.1 mi from Ubud, Padma Resort Ubud offers luxurious accommodations surrounded by lush greenery. WiFi access is available throughout. Spacious and well appointed rooms here are fitted with air-conditioning, seating area and a balcony. They also feature an iPod docking station, cable TV with a DVD player, and ironing facilities. Private bathroom comes with a shower, bathtub and free toiletries. 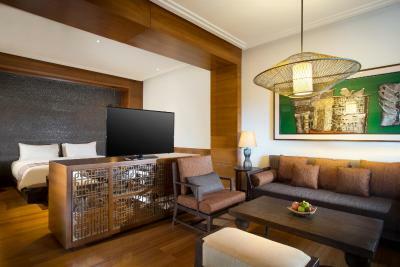 At Padma Resort Ubud, the friendly 24-hour front desk staff can assist with laundry and airport transfer services. An outdoor pool, kid's club and children's playground are available, while guests can also arrange for an event at the meeting/banqueting facilities. Relaxing massage is available upon request. 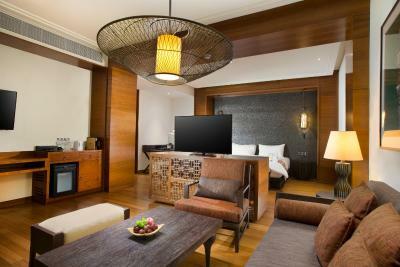 Seminyak is 23 mi from Padma Resort Ubud, while Nusa Dua is 29 mi away. Ngurah Rai Airport is 26 mi from the property. This property also has one of the top-rated locations in Payangan! Guests are happier about it compared to other properties in the area. This property is also rated for the best value in Payangan! Guests are getting more for their money when compared to other properties in this city. 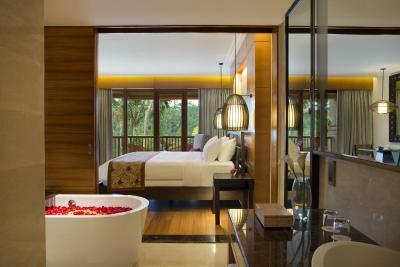 When would you like to stay at Padma Resort Ubud? This spacious and air-conditioned double room has a balcony, cable TV and parquet flooring. Private bathroom comes with a shower, bathtub and slippers. Located on the 2nd and 3rd level, air-conditioned room features a private balcony. Guests enjoy exclusive Club Access to the Wine Lounge where one can enjoy afternoon tea and evening cocktail overlooking the lush bamboo forest and Mount Agung. This twin/double room has a balcony, DVD player and cable TV. For a minimum stay of 4 nights, guests are entitled to one-way free airport transfer (pick-up only). This twin/double room has a balcony, seating area and DVD player. For a minimum stay of 5 nights, guests are entitled to free return airport transfer. Ensconced within an untouched river valley overlooking the enchanting bamboo forests of Payangan in Ubud;stunning views from every room or suite, an 89-metre infinity swimming pool and signature world-class dining venues. 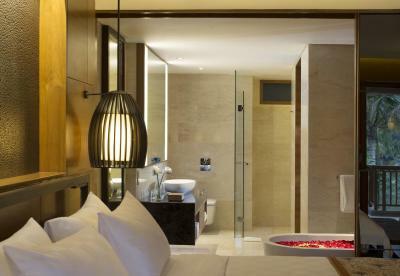 House Rules Padma Resort Ubud takes special requests – add in the next step! 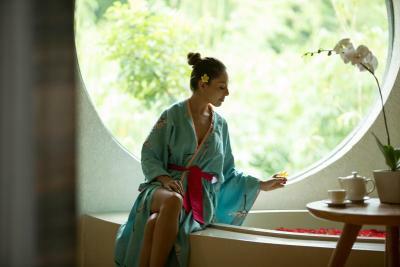 Padma Resort Ubud accepts these cards and reserves the right to temporarily hold an amount prior to arrival. Please note that guests are required to present the credit card used when booking upon arrival at the hotel. If guests failed to present the credit card, another payment method will apply and hotel has the rights to reject the bookings. Please note that guests booking the nonrefundable rooms are required to settle the full payment upon booking. The staff will contact you directly through email to provide the payment gateway link. Payment has to be settled within 48 hours of receiving the link, otherwise the booking will be canceled. Guests booking flexible rates are required to pay 1-night deposit upon booking and settle the full payment upon check-in. Didn't realise it was about 40 minutes from the resort to centre of Ubud - however, good resort shuttle service compensates. Excellent resort, worthy of 5 stars. Staff helpful and friendly. Lovely room and grounds. Inviting infinity pool with swim up bar. Variety of on site activities for the kids. 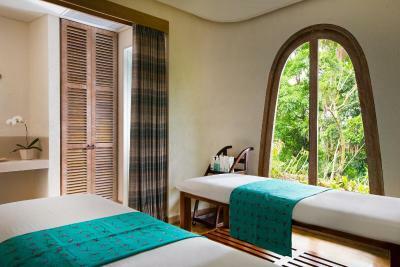 The Spa rooms - soothing for the soul, beautiful and tranquil. I could have sat there and sipped my herbal tea all day long! Will definitely stay again and bring the family along next time. The swimming pool bar man named Mariasa. To crowded. Landscape. Cleanness. Room shape and design. Indonesian breakfast coupled with sublime panoramic jungle views! And the pool! 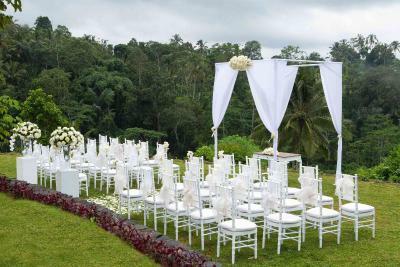 The location is very far from ubud center and every activity. I paid 700,000 iddr for transfer from air port to hotel. It quite far from even Ubud city, but it can be opposite like advantages. This is really luxury hotel! I was surprised when I saw my room number, it is perfect - all new, modern and like from movie! Personal is excellent! Breakfasts were also amazing. Thank you Padma Ubud for made my honeymoon best of the best! A bit far from Ubud and civilization, but they have free transfer to city if you will miss noisy life) hard to get taxi, need to take from hotel or deal with taxi drivers in the city from before. It’s a bit pricy compared to other resorts in Bali, but totally worth it! Ceiling fan would have been great. Air conditioning not always required. Location location location. Incredible staff, polite and understanding. The accommodations were clean and beautifully appointed. One pool tha place was very very boring. The hotel haven’t SPA. We paid 4 days and we left the hotel the second day. I got my nails done at the spa and waited a whole day for the nail polish to dry and it never did , as soon as a went to bed at night the nail polish smudged. We checked out in the morning so I couldn’t get it fixed. I paid $100 dollars for that, so I was very disappointed. Apart from that, there’s nothing I didn’t like about this hotel. This place is paradise on earth, wonderful! The staff welcomed us and were always so friendly throughout our stay. The food is so good, nice breakfast and buffet dinner was incredible. Complimentary shuttle to town every day. The room was spacious and the bed comfortable. The views are magnificent! Heated pool so it didn’t matter if it rained a little, it was even better. They held a Valentine’s Day dinner near the pool, with live romantic music, everything was done to perfection. I can’t wait to be back!